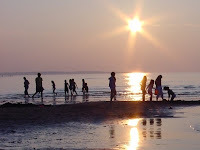 Seascape Chalet: Luxury PEI Vacation Rental: Family Summer Fun! Planning a special family vacation? -- There is something here for everyone! Relax at home in our luxuriously appointed chalet. Bask in the warm glow of a radiant sunrise and perhaps catch a glimpse of our resident red fox darting across the field. Take in the views from our comfortably furnished living room or while relaxing in the sun and fresh air of the wrap-around front deck. Parents can allow the morning to linger and calmly get ready to set out for the day while the kids enjoy a game, activity, book or video from our extensive collection for children and adults. Prepare a picnic lunch while the children play on the slide and swing set, invigorated by the fresh seaside air. Photograph the seaside views or the lupins in the front yard. 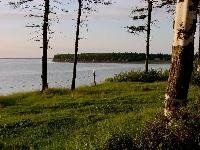 Explore the shoreline and open spaces of the tranquil peninsula. Snooze on the hammock while the kids examine their beachcombing treasures. Play ball, fly a kite, or play frisbee with Rover in the acre of adjacent park area with plenty of room to roam. Bike or jog the miles of clay roads. Run over to the pier for boating, jetskiing, windsurfing, or parasailing. Visit a dinosaur museum on your way back. 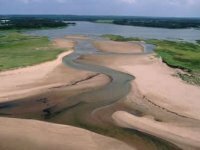 Put in one of our kayaks at the shore and explore the sand dunes of the PEI National Park or the Hope River estuary in the other direction. 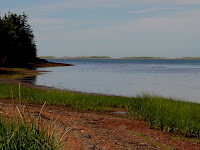 Watch the fishing boats in the bay or the oyster farmers inspecting their bounty. Spot a blue heron spying you as you dig for clams along the shoreline. And that's before you even get into your car! 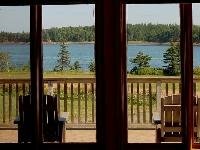 By car, within 5 minutes, you can: build sandcastles or play in the surf at Cavendish beach, ride horseback along a wooded farmland trail, take in a ceilidh at Stanley Bridge Community Hall or tee up at one of three premier 18-hole golf courses. Revisit the "Anne" era at Green Gables house or Avonlea Village, enjoy a relaxed family outing of healthy recreation at my favorite 9 hole course, or satisfy your child's or teenager's sense of thrill at a nearby amusement park. Buy fresh lobster or shellfish at Stanley Bridge wharf or sample the seafood at an oyster bar. Try PEI's famous "Cow's" ice cream and buy a T-shirt to commemorate the experience. 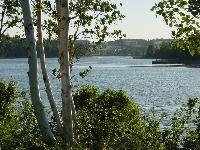 Walk one of the many community trails over varied terrain, bike and explore the stunning seaside "Homeland Trail", or put in your fishing line at a nearby brook. Have your postcards stamped at the Cavendish post office museum and check out the range of art and craftsmanship of PEI artisans. Take a deep-sea fishing charter and cook up your filletted catch in our fully-equipped kitchen. With the kids in bed, reflect on a wonderful day while relaxing in a luxurious decor featuring my own original seaside-inspired works in stained glass displayed exclusively for you. Think a family vacation must be a compromise? Not this time! Seascape Chalet is especially suited to families, because we've prepared it for you with our own family in mind! Kids are captivated, so adults can relax in our comfortable surroundings. 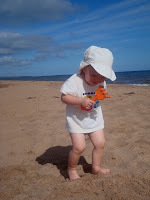 Read the review: "PEI: A recipe for family fun!". The past 11 days have been a great family vacation, and staying at your property had a lot to do with our tremendous experience. From the moment we first stepped into the chalet, we were "breathless," as the decor and scenery were unbelievable. 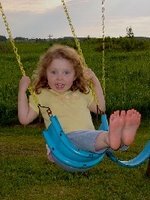 Our two daughters enjoyed immensely the swings and toys during our stay as they both entertained them on a constant basis. Philip & Dawn, the both of you should be very proud of your property, as the chalet is beautiful, and you have provided everything needed to make a family vacation a great experience. 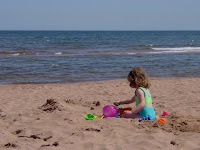 We will definitely be wanting to stay here again on our next visit to PEI. 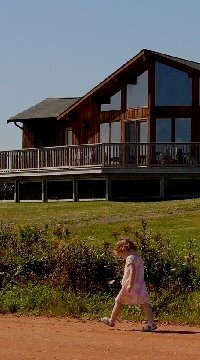 At Seascape Chalet, family-friendly amenities include abundant space inside and out, numerous games and activities, book and video library, outdoor play area, plentiful trails, protected shoreline and close proximity to all the attractions of Cavendish. With our well-equipped cottage and tranquil, scenic and central location, there are many activities to captivate each and every member of the family! Come play on our Island. We look forward to having you!